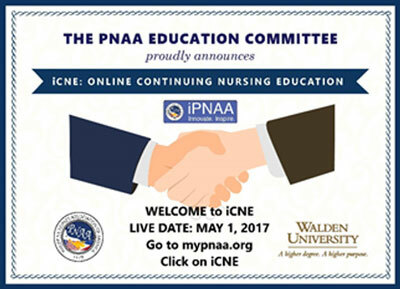 This service to members endeavor was realized with the partnership between PNAA and Walden University as CNE provider. This is a great opportunity to support our members with the ability to complete contact hours at their convenience and without undue burden to their busy schedules. Currently, the iCNE sessions are 60 minutes long for 1 contact hour. Certificates of completion are generated after evaluation requirements are done. Walden Supports You in 2018! Walden values Philippine Nurses Association of America as a partner and would like to guide you and your employee's on the journey to explore three on-demand wellness webinars led by Walden's expert faculty. This session will help you put healthy parameters around a very modern workplace problem. This presentation will identify how elements work together to create burn-out and will provide several strategies to recover. In this session, find out how you can turn workplace turmoil into the foundation for organizational health. To learn more about Walden's degree programs visit www.waldenu.edu/pnaa or contact an enrollment advisor for more information. As a nurse, you wear many hats. You’re a leader, an educator, an expert clinician, and a healer. Every day you solve new challenges. You know the importance of developing your skills and always continuing to learn. This summer, we’re introducing a new opportunity to advance your practice. Christus Trinity Mother Frances and Walden University proudly invite you to take advantage of a new professional development opportunity for nurses. Our Summer Scholars webinar series is designed to help you build new skills in all aspects of your nursing career. Walden University is excited to celebrate PNAA members during National Nurses Week. Join Walden University as we celebrate the heroism of nurses in our communities with a webinar screening of The American Nurse. The American Nurse introduces five fearless nurses who serve on the front lines of healthcare, navigating their patients through birth, death, prison, war, and poverty. If you have not seen the movie, please view movie trailer HERE. We invite you to participate in a virtual viewing of the movie via webcast as well as a Q & A session with the Filmmaker organized by Walden University to celebrate your nurses during Nurses Week. · Virtual Screenings of The American Nurse – Earn 1 contact hour! Nurses can participate in one of six virtual screenings of The American Nurse movie and receive contact hours. You can even host a viewing party during of one of the live screenings at your hospital and watch the movie as a group. · Q&A Session with Filmmaker – Thursday May 18th @ 7pm. Nurses will have the opportunity to attend a Q&A with the filmmaker Carolyn Jones. Contact hours will also be awarded for those who attend this session. To register for the Q&A session click HERE. *Note: Nurses must be present for the entire screening or Q&A to receive contact hours. An evaluation link will be provided at the end of each screening to receive contact hours. Abstract: Nursing shortage is a growing concern, with an estimated 30-50% of all new RN’s either changing jobs or leaving the professional within 3 years of clinical practice. What is fueling this? Join this webinar, “The Future of Health Care – The Promise of Nursing,” and learn how the Affordable Care Act and Value Based Purchasing may impact the nursing shortage, evidence-based practice, patient care, and ultimately the promise of the future of nursing.